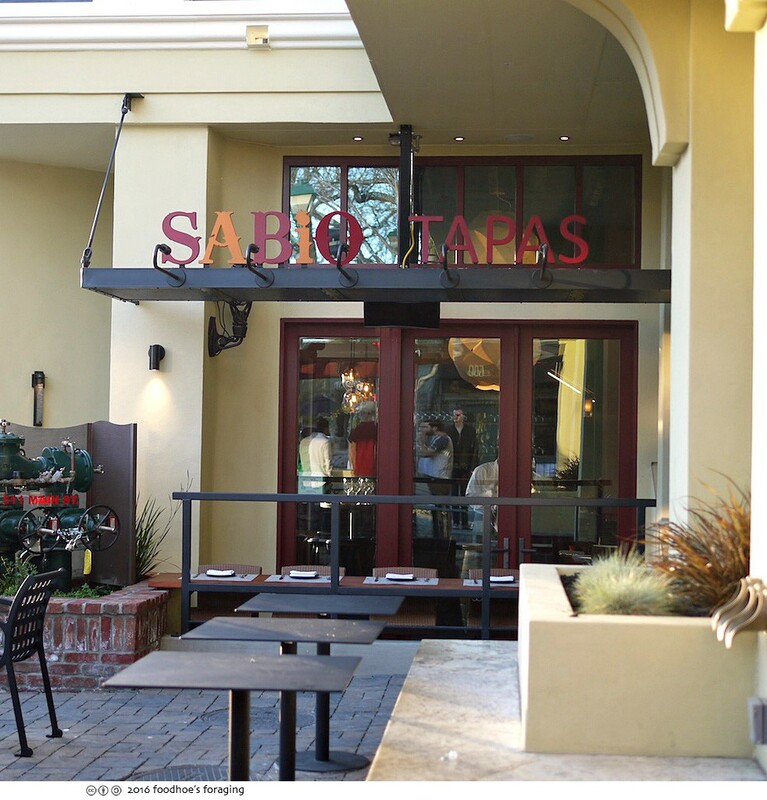 Last weekend Mr. K and I drove out to Pleasanton on 580 past miles of green rolling hills dotted with oak trees to check out the chef’s tasting menu at Sabio’s on Main, a tapas restaurant in the heart of downtown which opened last year. Neither of us has spent much time in the area, we mostly have been to the IMAX theater in nearby Dublin or shopping at Stoneridge Mall, so following Siri’s instructions, we drove to Main Street, which turned out to be a charming and bustling destination with lots of cool shops and restaurants. Sabio is on a corner and the entrance is also set back a little behind a very busy Starbucks so we totally missed it the first time around. The interior is pretty stunning, I am pretty sure I walked in looking around with my mouth wide open… but the host didn’t blink an eye. I must tell you that we were invited to dine as guests of the house, so they were expecting us and I got a personal tour of the striking interior and took some photos before it got too busy. 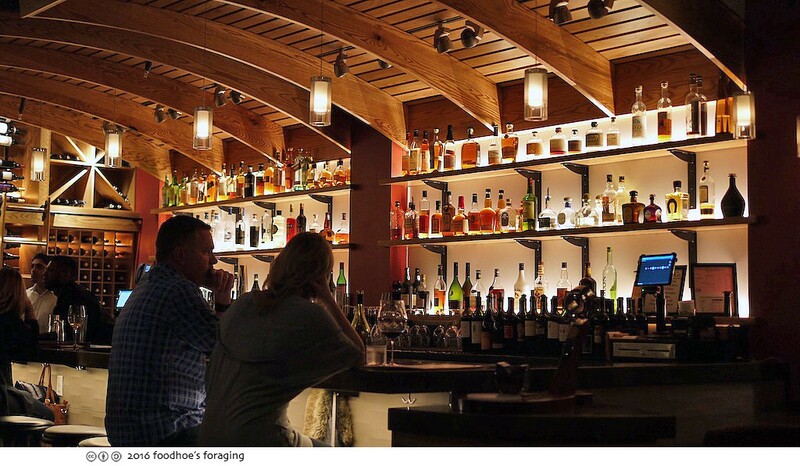 The space was designed by Jim Maxwell of Architects II (who also did Gather, Tribune Tavern, Chop Bar, Lungomare and The Cooperage, all gorgeous East Bay restaurants), and while it is dominated by the dramatically glowing bar, the 98 seat dining area has tall ceilings and a very open feeling that it is broken up into several distinct areas that still allows intimate conversation and we were easily able to hear each other throughout the course of our meal. The restaurant is one of those magical places that make everyone look good, the vibe is sophisticated but not at all stuffy or contrived and it seemed like everyone was having a good time, even the staff. 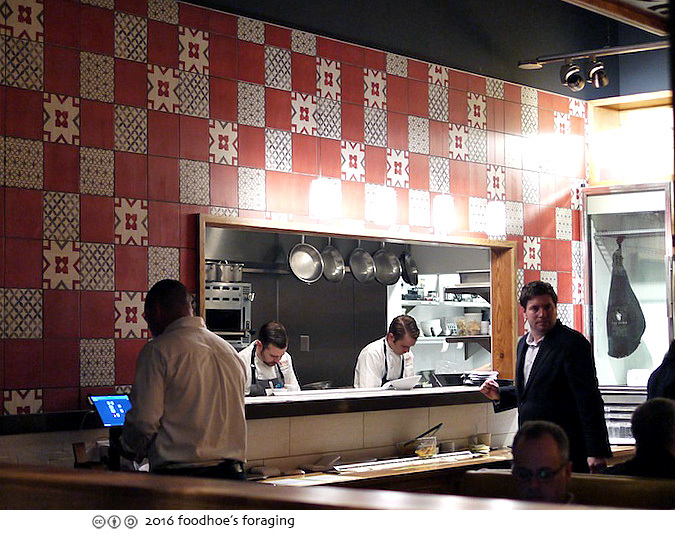 In the back corner of the dining room, the kitchen window is set within a framework of colorful Spanish inspired tiles where you can watch the chefs at work, they seemed very focused and calm, even with a full house. 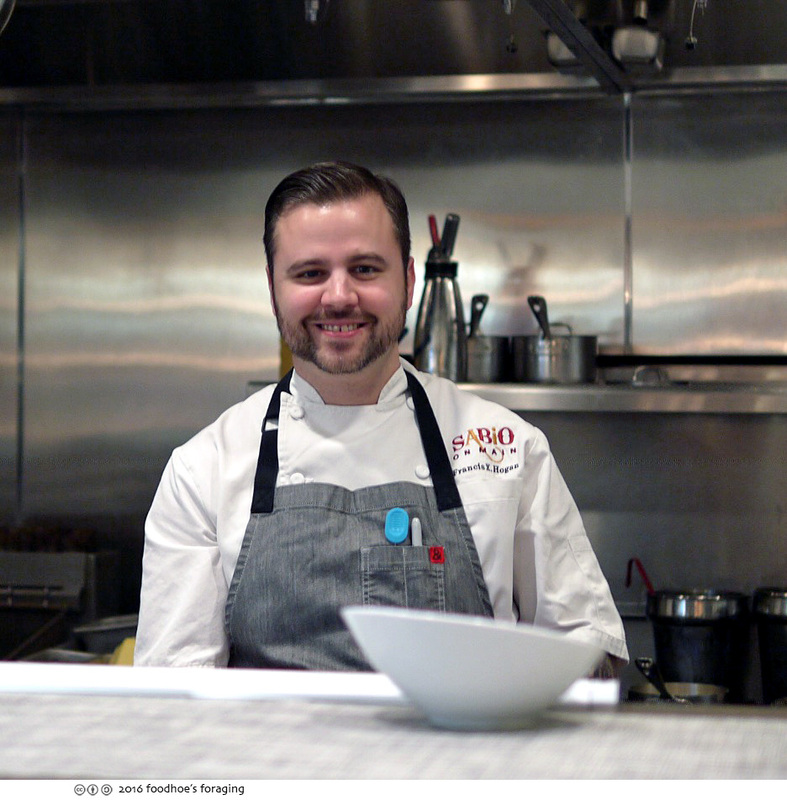 This is the executive chef and co-owner Francis X. Hogan. He was friendly, shook my hand and even smiled for the camera. 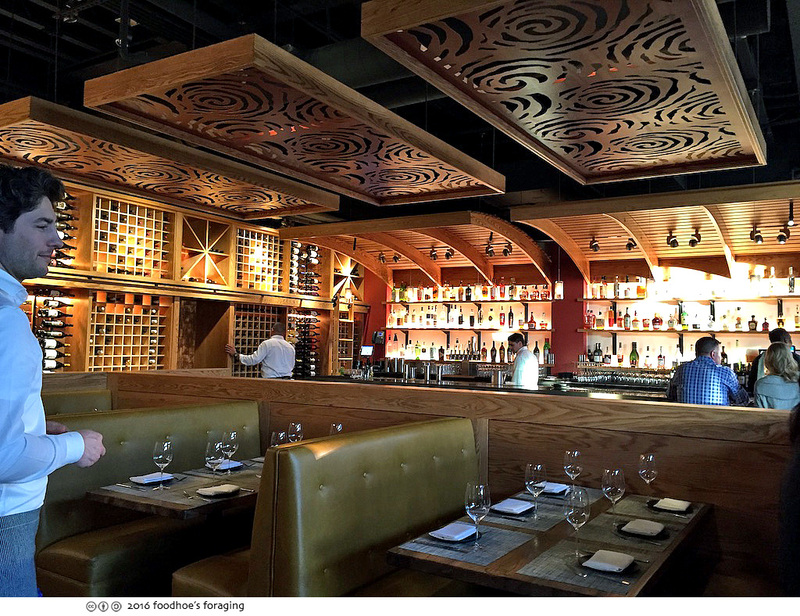 The chef is a seasoned pro who has previously worked at Farallon, Hawthorne Lane and most recently, Bluestem Brasserie. He was very enthusiastic and intensely into what he is doing; according to the website, he is proficient in whole animal butchery, charcuterie, and cheese mongering, he is a certified sommelier and has been featured at prestigious culinary venues such as the James Beard House in New York City and CUESA in San Francisco (wow, right?). 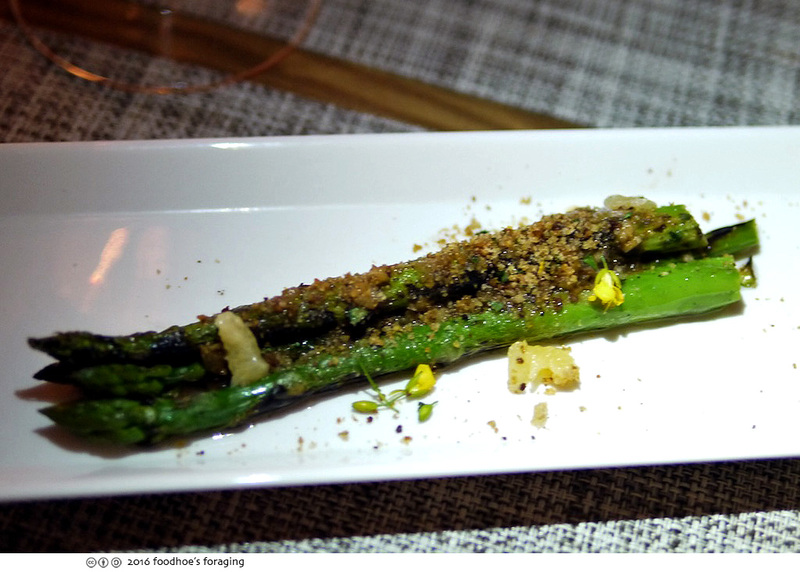 He said they are hyper-seasonal and ingredient focused and feels very strongly about working with local providers to source the best ingredients all of which are noted on the menu, and more info can be found on their website. 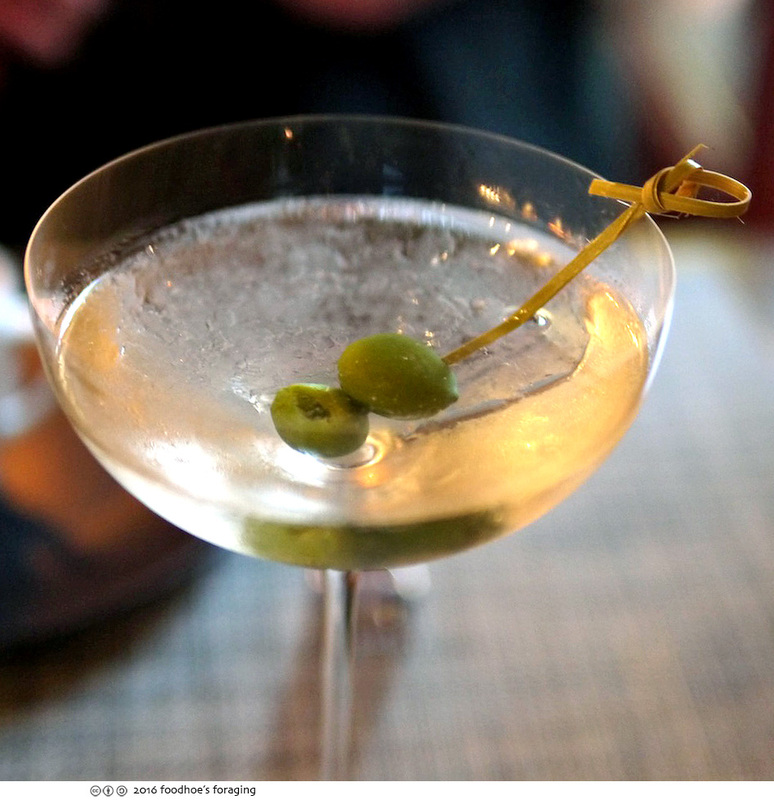 We sat at a comfortable table for two and Mr. K ordered a martini made with Hendricks gin, up with olives. 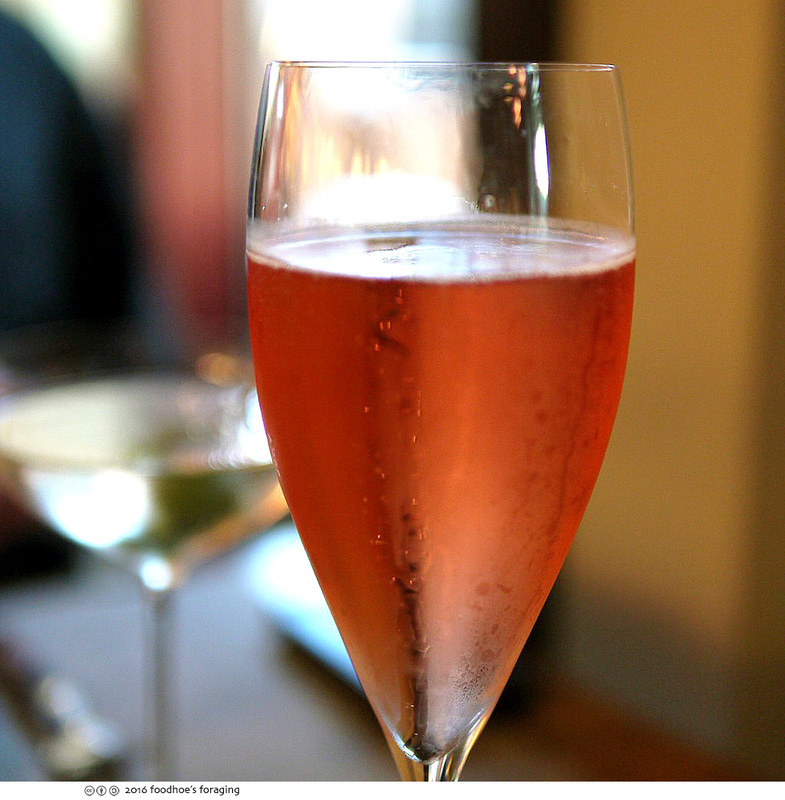 I enjoyed the wine pairing, which began with a glass of 2011 Cava, Llopart Rose from Spain, which was light-bodied and refreshing. 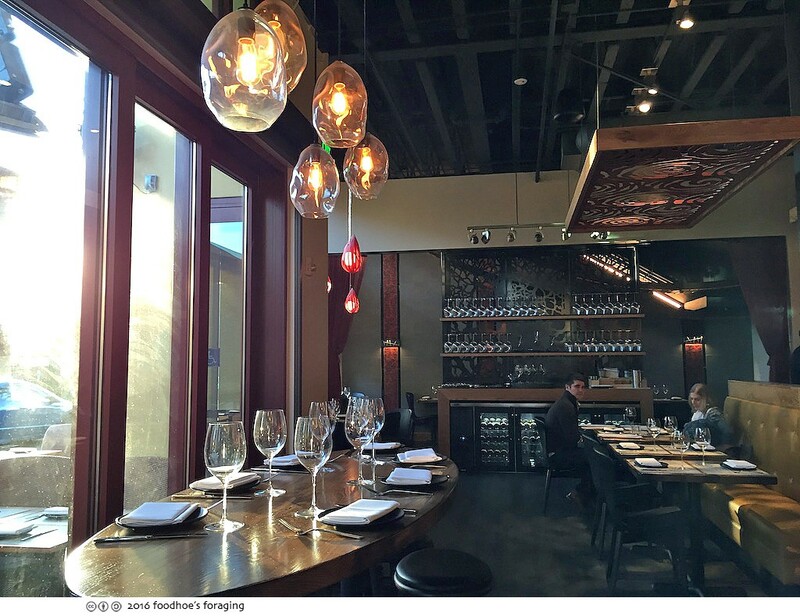 The wine list tends to favor local small production wines, unknown gems and out-of-the-ordinary grapes and regions with several cult and hard to get wines. 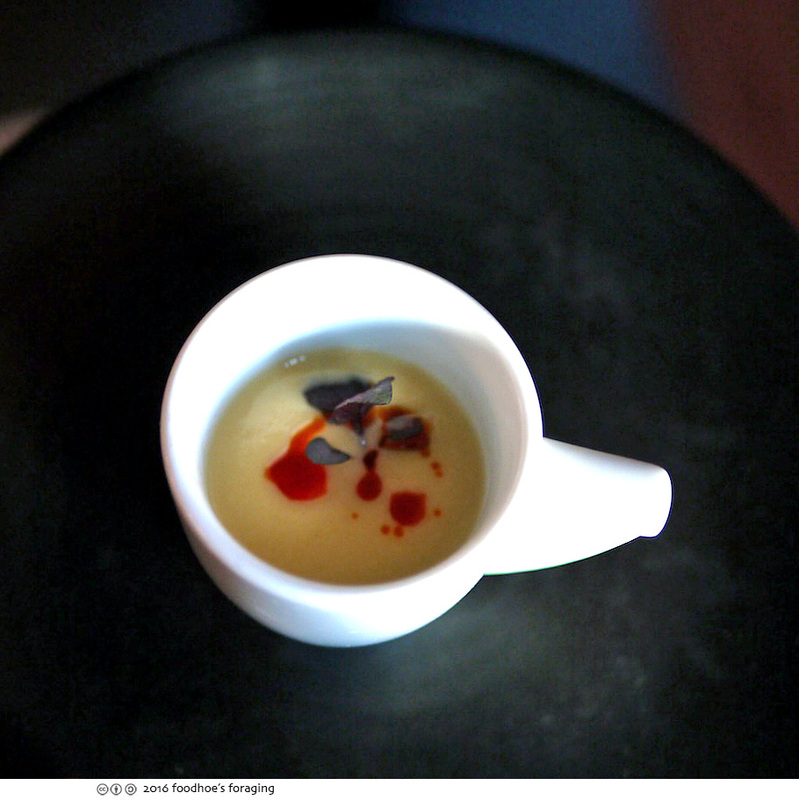 We began our delicious journey with an amusement from the chef, a small cup of rich cauliflower soup drizzled with a smoked chili oil and delicate micro shiso leaf, that had us smacking our lips. Next were a series of pinxto which are little bar snacks that are often served on a little skewer – typical things you’d see on a Tapas menu. 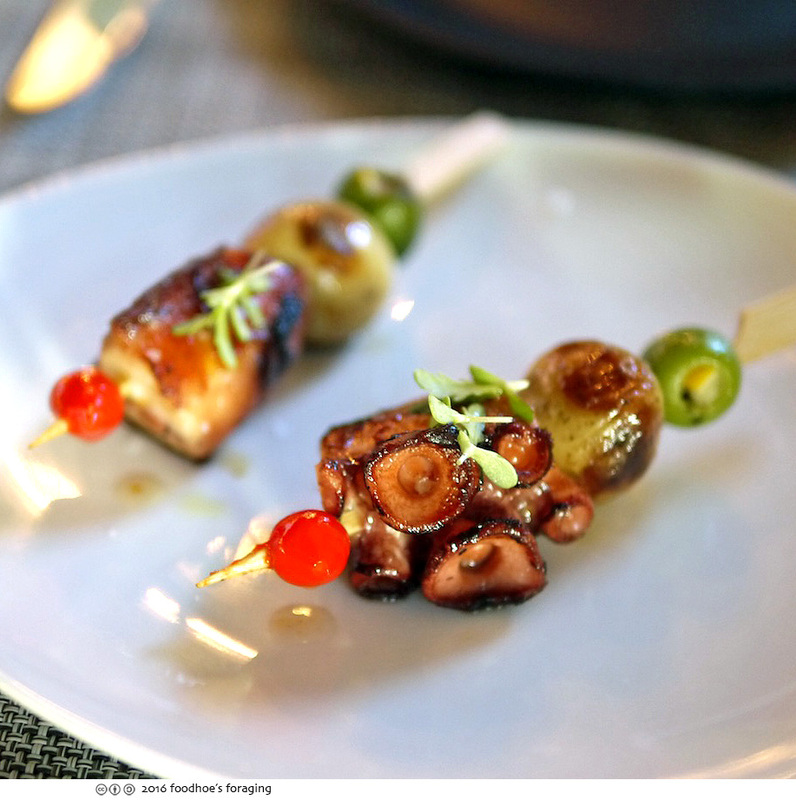 The first was made with grilled octopus, Zuckerman potato, a stuffed olive and a sweety drop pepper, which was sweet and slightly hot. The octopus had a nicely seared and caramelized exterior that made me take smaller bites to maximize the moment, the flesh was also juicy and tender, the olive was warm and infused with the sultry flavor of the meyer lemon, the tiny pepper added an exquisite heat – everything came together very well. 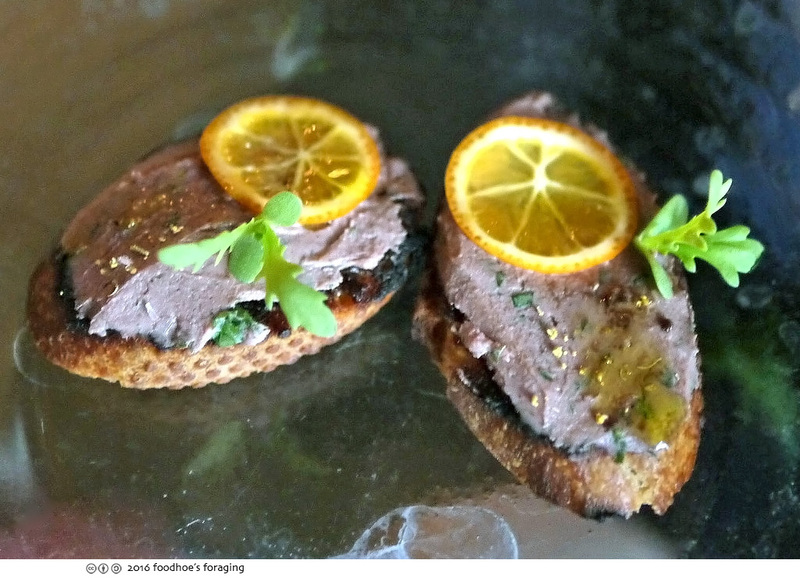 Next was spiced rabbit and duck liver mousse on toasted house sourdough drizzled with fig jam, fennel pollen and a paper thin slice of kumquat which added a tart and bitter counterpoint to the rich flavors of the mousse, subtly layered with the different sweet and savory ingredients. 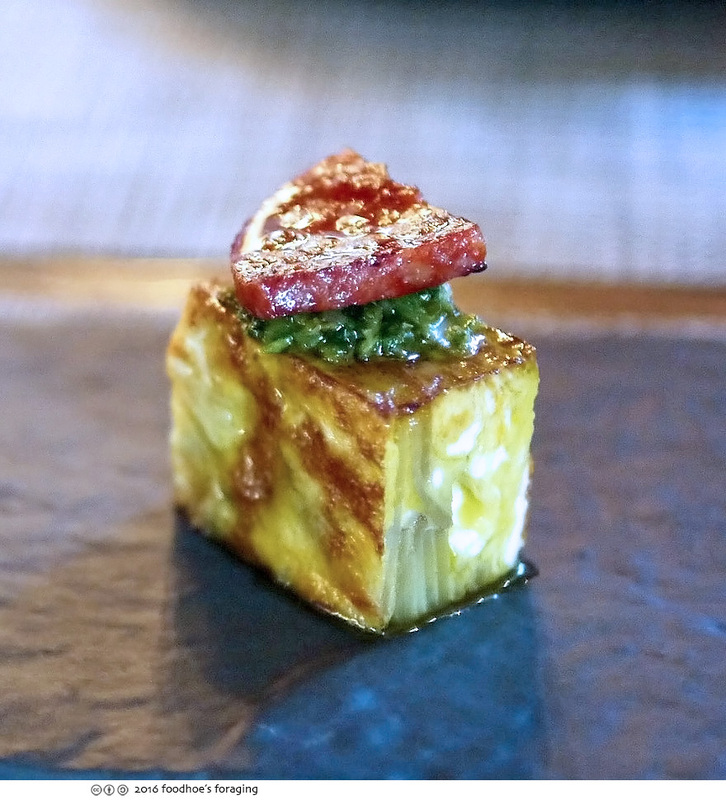 I swooned over the Tortilla Espagnole (spanish omelette), which was a gorgeous little cake of onion, egg and potato that was like a savory velvety custard with delectably crispy edges, topped with a bit of salsa verde, a slice of chorizo, drizzled with arbequina olive oil. 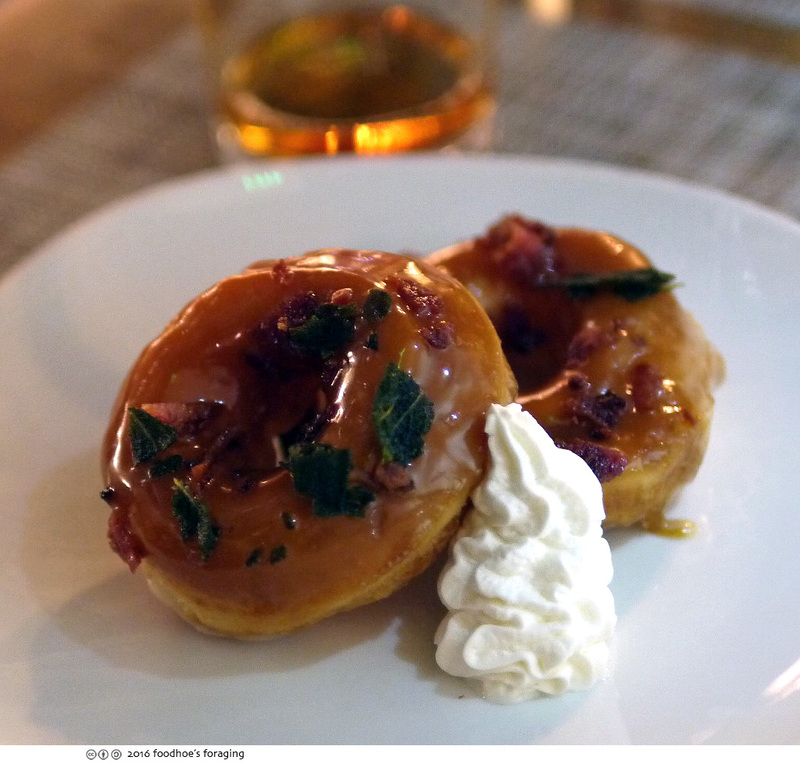 Small, potently rich and irresistible… and gone all too soon. 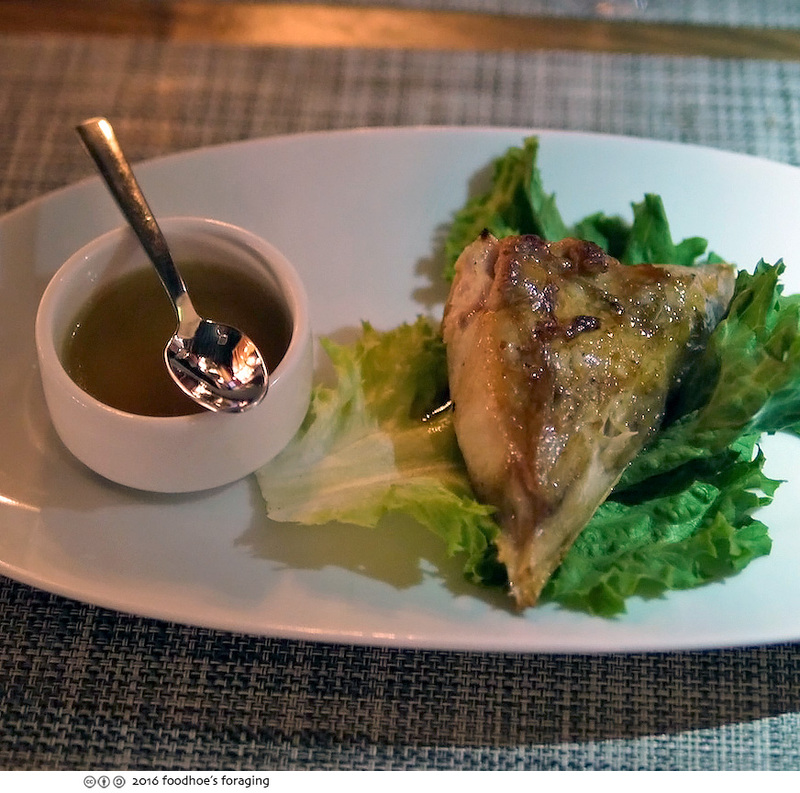 We disembarked from the tapas trail and moved onto Crispy Devil’s Gulch quail, battered and fried and tossed with sweet, spicy and piquant General Tso’s sauce, then sprinkled with black and white sesame and served over a light asian slaw, which is made with lime, fish sauce and sesame oil. 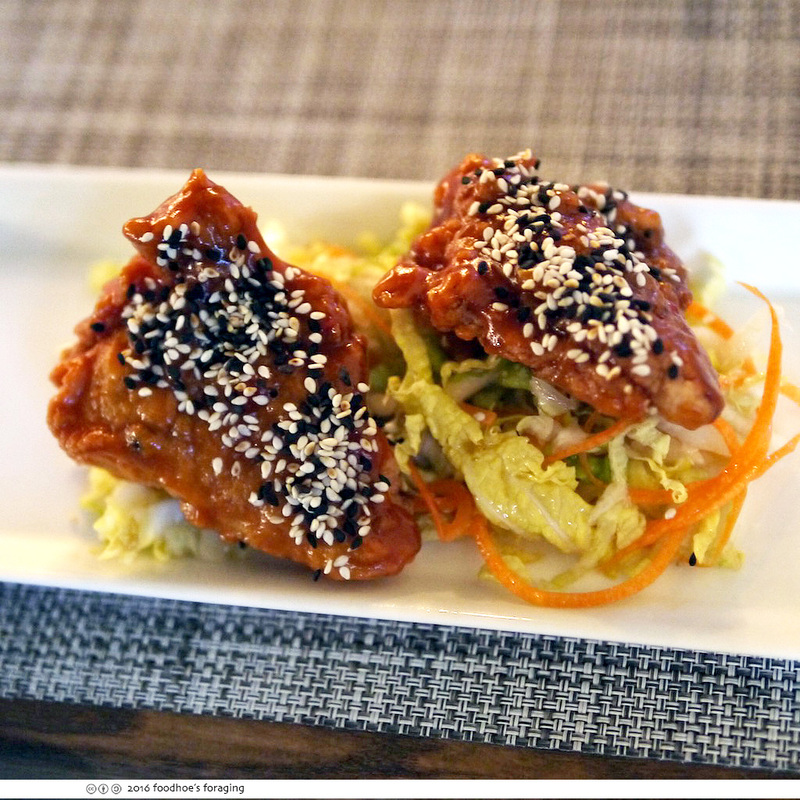 It was the best interpretation of General Tso’s we’ve ever had. The next destination was Japan with a roasted Hon Hamachi collar, served with an yuzu kosho and white soy dipping sauce, and meyer lemon. Chef Francis said he poached it in dashi first then roasted over dry heat which resulted in flesh so tender and succulent it fell apart at a touch, and I found myself eating with my hands, sucking the delicate bones, drizzling that wondrous sauce over each bite… This was paired with a bright refreshing 2015 Albarino, La Marea, from Monterey. The party continued with bacon wrapped Devil’s Gulch rabbit with a rich fragrant rosemary jus garnished with tiny edible flowers, charred romanesco (a neon green relative of broccoli) in a delectable puddle of cara cara marmalade that was a bright counterpoint to the posh smoky flavors of the bacon, paired with a 2011 Pinot Noir from Sandler Wine Co.
We enjoyed a cheese course of a buttery, dense and fudgy Twin Sisters Whatcom Blue, garnished with crisp slices of pressed fennel, marcona almonds served over dots of quince jam, and drizzled with port gastrique, olive oil. 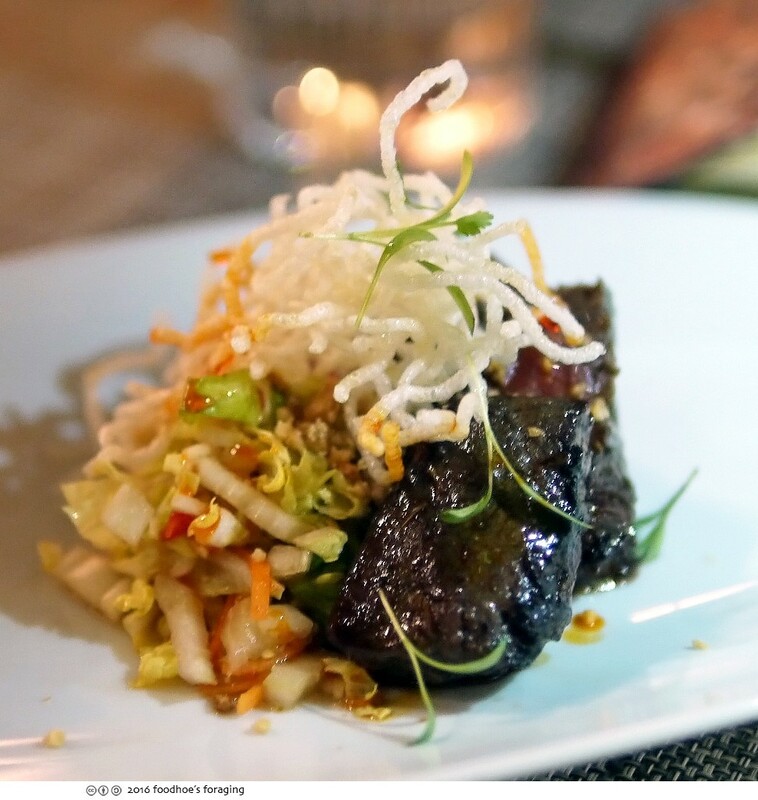 This dish was full of so many elements to tantalize your tastebuds. 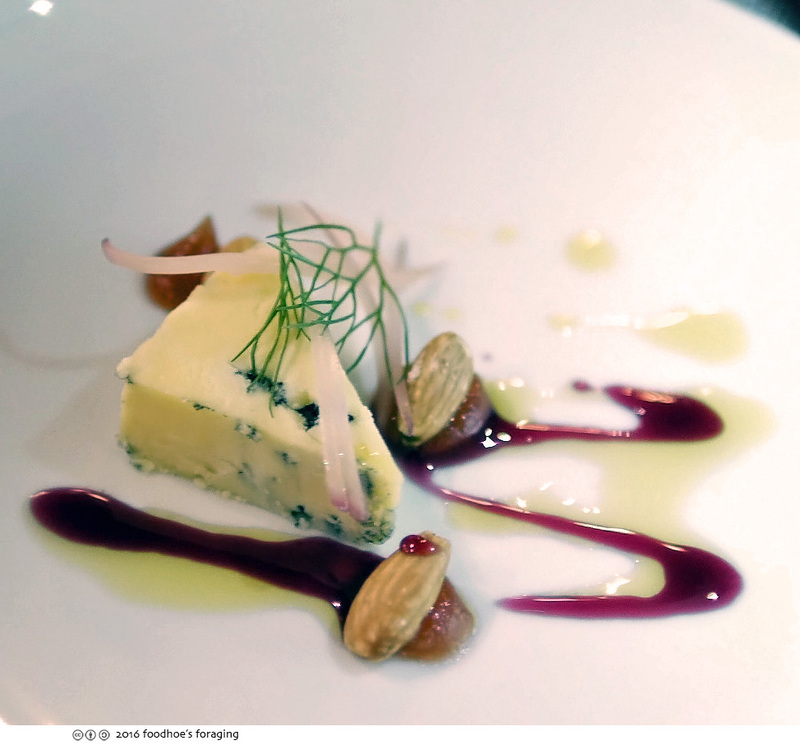 Thank you again Sabio and Chef Hogan! 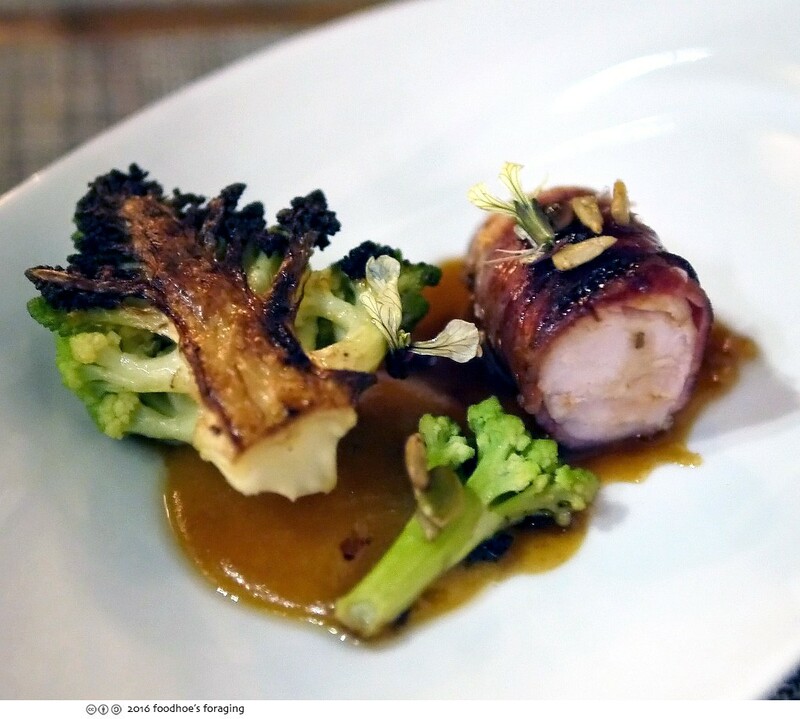 It was a memorable meal full of great flavors and tastes, I definitely recommend the tasting menu ($85), which showcases the best of the best, and due to the hyper-seasonality proclivities and culinary talents of Chef Hogan, is something to look forward to. We promise to come back for brunch, and they are now open for lunch on weekdays. i’ve become quite a fan of tapas! the only problem is that when there’s something i really, really like, i still only get a nibble of it! This place sounded so far, but glad you went so I can live through your photos. The tasting menu seems all over the place, although the dishes sounded and looked tasty. Is it a tasting menu for brunch too? The donut shop next door sounds like a great idea! Ben, it was just a 20 minute drive from our house with no traffic, so it ended up being about the same drive as the one we take to get to downtown Oakland… It was really good, I liked the crazy variety, it made the meal extra exciting. Previous post: Ramen at Mensho Tokyo in San Francisco!